Mary Duchess of Roxburghe wearing a piece of history, the largest of the four brooches of the Perles de la Couronne, which was orginally part of the French crown jewels. This shoulder brooch may be that which is shown right in the original 1887 auction catalogue . This brooch can be differenciated from the three other brooches by the number of diamonds around the two round pearls 10 diamonds around each round pearl ( two brooches have 8 diamonds around the round pearls, and one has 10 diamonds around the top pearl and 9 diamonds around the bottom pearl). The brooch, bought by Ogden Goelet, has a thin inner row of diamonds around the top round pearl, within the outer row of larger diamonds: it is perfectly visible on the Duchess of Roxburghe's portrait and is a difference from the three other brooches. Another one, smaller in size, is now on display at the Louvre Museum Paris. The mother-in-law of the duchess was the rich American heiress May Goelet. Ogden Goelet, her father, was one of the big buyers in 1886 of the French crown jewels. He bought this brooch for his wife; in her last will she bequeathed it to her daughter the Dowager Duchess of Roxburghe. Another piece of jewel he bought was lot 40 from the auction of the French crown jewels. Pearl Coronet Diadem " Couronnette de Perles et Diamants, bacon facturee par Lemonnier en 1853" Estimated price Fr30000 and sold to Sir (sic) Ogden Goelet for 38000 francs. Lot 41 from the French Crown Jewels auction was two pearl bracelets known as "Paire de Bracelet Perles et Diamants montee par la maison Bapst sous le second Empire. The estimated price was 60,000 francs and was sold to Sir (sic) Ogden Goelet for 90,200 francs. In the portrait the Duchess is wearing her natural pearl and diamond necklace from the late 19th century,consisting of one hundred and eight pearls, composed of two graduated rows of natural pearls,, composed of measuring from approximately 5.65-9-9.50 mm on a clasp of floral design set with circular-cut diamonds, length ca 420 mm offered by Sotheby's Geneva for $60,000-100,000 USD. 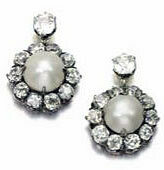 Pearl and diamond earrings late 19th century, each set with a natural pearl mass 10.6 and 11.1mm framed and on a surmount set with cushion-shaped and circular-cut diamonds. On auction at Sotheby's Geneva May 2015.